So Karl Rove is supposedly claiming that Plame’s CIA identity was just some rumor that had been floating around in the press corps? Some gossip he overheard and then passed along innocently to a national newspaper columnist? Rove testified last year that he remembers specifically being told by columnist Robert Novak that Valerie Plame, the wife of a harsh Iraq war critic, worked for the CIA. Novak, in an interview, said his sources had come to him with the information. "I didn't dig it out, it was given to me," he said. "They thought it was significant, they gave me the name and I used it." I wonder who has been lying to the Grand Jury, Rove or Novak? So far this case has been exciting a lot of commentary from the local blog community. Eddie Rodriguez at The Red State has been working hard to debunk the avalanche of spin coming out of the White House on this issue. The other day Bill Crawford at All Things Conservative helpfully reprinted the GOP “talking points” that try to smear Ambassador Joseph Wilson by repeating a lot of lies and misrepresentations of things he has said in the media. What exactly this has to do with the outing of his wife as a CIA agent I’m not sure. Perhaps they believe that the public will think that it is OK to expose our CIA operatives’ identities as long as their relatives’ reputations have been adequately besmirched first. Josh Marshall sums it up pretty well here. Now today, Bill is jumping all over the strange “Rove blames media” story claiming it completely vindicates him and puts the onus on Democrats for ever criticizing poor Rove in the first place. If we believe the Rove-friendly account in today's papers, someone had already spread around Plame's CIA job to both Novak and Rove. Who? Rove, by the account in the Washington Post, has conveniently forgotten. If we don't believe the Rove-friendly account, then this timing is extremely suspicious. Congrats to Peter on having his piece cross-posted at TPM Cafe. For those who desperately want to believe Rove’s story that some reporter was responsible for outing Plame first there is still one big question that must be answered - How did a journalist with no security clearance get ahold of this classified information in the first place? And how convenient that they should happen to get it right at a time when it helps the White House in their effort to damage the credibility of a top critic of their Iraq policy. The Wall Street Journal poll that is out today has Bush down to a 46 percent approval rating with 52 percent saying the country in on the wrong track. The Journal says that Bush's standing has been hurt by Iraq, his Social Security privatization scheme, and most recently by the Karl Rove scandal. The Journal story further warns that Bush "faces further political peril" if his Supreme Court nominee becomes embroiled in a protracted partisan battle. Meanwhile, in another WSJ story we learn that Special Prosecutor Patrick Fitzgerald is spending more and more of his time focused on Karl Rove and what he told Time reporter Matthew Cooper. I think an indictment is almost inevitable at this point. I expect to hear Bush announce soon that he has "full confidence" in Rove, which is always a sure signal that someone is about to get axed. Even if Rove stays though, Democrats are trying to raise the heat index on him by pushing legislation to revoke his security clearance. Imagine if the president's top aide had to excuse himself everytime any confidential security matter was being discussed. At least Rove can always take a job with the Journal's editorial board where they are waiting to give him a medal for blabbing about one of our CIA operatives. Here is Bush’s ideal Supreme Court nominee. 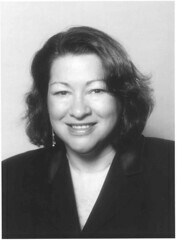 A Hispanic female with lots of judicial experience who was first appointed to the bench by Bush’s father. Plus she is guaranteed to have an easy confirmation. Of course, this presumes that Bush wants an easy confirmation process. But there are many reasons why he would rather appoint someone more extreme and provoke a fight. First, it would satisfy his base of extremist religious right fundamentalists. Second, it would distract the public’s attention away from the mess in Iraq, Bush’s failed domestic agenda and the Karl Rove scandal. Ambassador Joseph Wilson was right again. Wilson pointed the finger at Karl Rove as the White House culprit who outed his wife from the CIA more than two years ago. Now we are finding out that Rove was indeed the source for at least Time Magazine reporter Matthew Cooper who learned from Rove that Wilson’s wife worked for the CIA more than three days before Robert Novak’s column ran exposing that fact for all the world to see. So far the White House is is refusing to comment on the unfolding scandal. For two years, the White House has insisted that presidential adviser Karl Rove had nothing to do with the leak of a CIA officer's identity. And President Bush said the leaker would be fired. But Bush's spokesman wouldn't repeat any of those assertions Monday in the face of Rove's own lawyer saying his client spoke with at least one reporter about Valerie Plame's role at the CIA before she was identified in a newspaper column. Well, that’s OK, because Billmon has helpfully compiled a long list of relevant quotes from White House officials over the years denying Rove’s involvement. Lies, lies and more lies. Now the only question is why Rove is still a member of the administration after Bush said long ago that he would fire whoever was responsible for the leak? Surely, Bush would not go back on his word! I think it is just a matter of time now before Karl Rove joins Ken Lay on the list of GOP pariah’s whose name is never spoken by the president. After chastising Democrats for suggesting that we need to set a timeline for withdrawing the bulk of our troops from Iraq, it now seems that the Bush administration has been secretly planning to do just that all along. "emerging U.S. plans assume that 14 out of 18 provinces could be handed over to Iraqi control by early 2006," allowing a reduction in overall U.S.-led forces in Iraq to 66,000 troops. The troop level is now at about 160,000, including 138,000 American troops, according to a military spokesman in Baghdad. This is good news because it means that maybe, just maybe, the Bush team is not as stupid as they have pretended to be lately. I’ve had a hard time understanding why Bush has been so stubborn about setting a timeline or even defining the terms of victory in Iraq. The polls have shown that support for the war is plummeting the longer it drags on. Right-wingers whine that this is because the so-called liberal media hasn’t been cheerleading loudly enough on the sidelines, but the truth is that even when our subservient media bows down to the GOP agenda and obediently refuses to show pictures of the coffins and bodybags coming home, they can’t completely cover up the fact that more than 1,700 U.S. troops have been killed and more are dying everyday. It amazes me the number of times in recent weeks where I have had casual conversations with very conservative Republicans who, upon learning that I am a liberal Democrat (quite rare in these parts), confess their reservations about the war in Iraq. They may not agree with me that we should never have gone in in the first place, but they do agree that it is high time that we started getting out. So if pulling out would be politically popular why are they refusing to say they would even consider it? This new memo makes things a little more clear. As long as they start pulling out before the 2006 mid-term elections they can benefit from that politically. In the meantime, they can continue to blast Democrats for being terrorist sympathizers, weak on defense, cut-and-run cowards and so forth even while making plans for a massive drawdown early next year. In fact, the White House seems to be even more anxious to pull out than their counterparts in the Pentagon, according to the memo. The memo, posted on the newspaper's Web site, notes a debate between U.S. officials at the Pentagon and military leaders in Iraq, saying that officials in Washington favor "a relatively bold reduction in force numbers," differing with battlefield commanders, "whose approach is more cautious."